In this Washington Post open letter to President Obama, the wife of a Georgia public schoolteacher describes the state of emergency students and teachers are currently facing. It is beautifully composed and deserves a read. When my collaborator and I began planning this semester, we were not sure what we wanted to teach about per se, but we knew we had to discuss Trayvon Martin. We could not ignore him — his murder was plastered all over the internet, his name came up in most conversations; his iconic, hoodied picture was immortalized on our students’ T-shirts — Trayvon’s story had to be discussed, if for nothing else but to understand tragedies that happen not only in the literature we read, but also in the world around us. Whether you agree or disagree with our president’s political agenda, there is incredible honesty in these words. They cracked open my heart and touched me in a way I thought impossible — in a way that allowed me to see the situation of a person whom I cannot relate to on a literal scale no matter how hard I try because of the privilege I was born with — a privilege of fitting naturally into the normative societal scale of acceptance because of the color of my skin. I began to understand this concept more after reading Peggy McIntosh’s White Privilege: Unpacking the Invisible Knapsack. What struck me most is that, before I began to consciously think of these ideas, I never thought about them. Sure, the sentiment is simple, but no matter how obvious it is to me now, I still never consciously paid attention to my situation in life before I was told to, so, I guess that is why I am sharing my revelations with you now. While my initial reaction is to roll my eyes, as this meme is making light of a heavy situation, there is truth here. According to Malco (2013), “race matters in this country are the paralysis of the American people.” In other words: when issues regarding race come up, we either 1. talk ourselves in circles, going nowhere or 2. ignore matters of race altogether. Sure, this is a silly meme which is not meant to be taken seriously, but the sentiment here is very serious, and something which should not be silenced further. 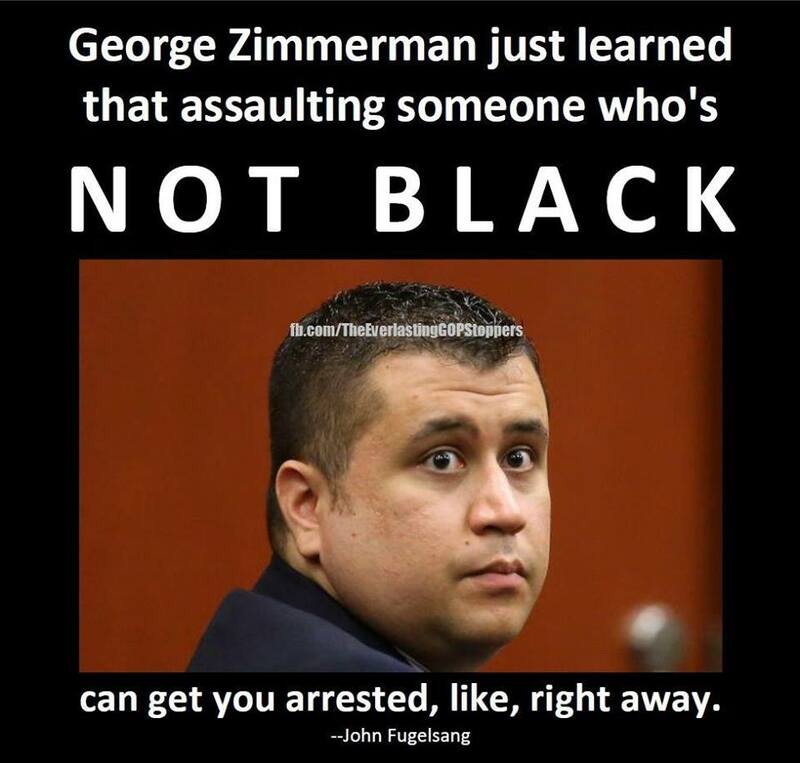 So, to answer my original question: what do we do with George Zimmerman? My answer is: I don’t know, but we cannot ignore him — to do so would be like slapping Trayvon in the face. However, we also cannot give into the media’s ploys to make money off of his demise.